When applying for your first job in UX, it’s not enough to just say that you’re a designer; you need to prove it, too. This means coming prepared with a professional portfolio and showcasing your skills in action. Your portfolio is a personal website that introduces you as a designer and features a selection of your work. It’s not just an add-on to your resume; it’s your chance to shine and tell a compelling story. In fact, in the design industry, your portfolio will often mean the difference between a rejection and an interview — so it’s important to get it right. But what exactly does “getting it right” involve? We asked UX design expert, CareerFoundry mentor and startup coach Tobias Treppmann for his advice. Here are his top tips for creating a killer portfolio. UX portfolios tend to follow a very standardised format these days and, according to Tobias, this isn’t necessarily a bad thing. When structuring your portfolio, you don’t need to reinvent the wheel; simply find an existing portfolio that you like and emulate the basic layout. This might not seem like the most creative approach, but it can make your portfolio more user-friendly. Recruiters will be familiar with the format, and you’ll have a tried-and-tested structure to work with. Whenever a recruiter lands on your portfolio, the first question they’ll be asking is: “Is this person a UX designer?” In a split second, they’ll decide whether or not they’ve come to the right place, so give them the answer they’re looking for. This might sound obvious, but be sure to portray yourself as a UX designer in no uncertain terms. 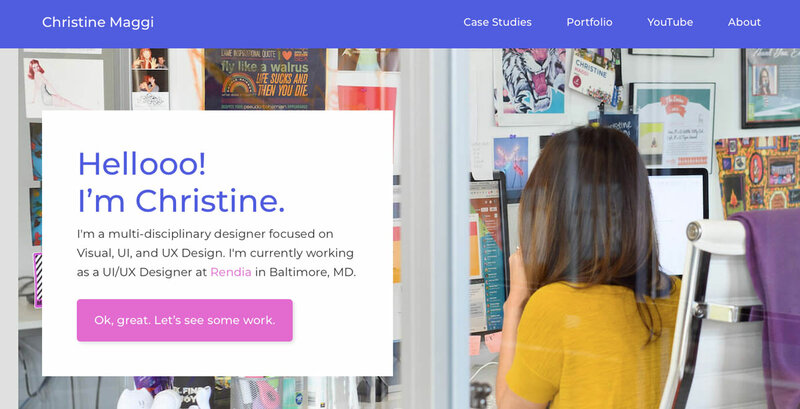 On your portfolio homepage, include just one prominent sentence stating who you are and what you do — just like Christine Maggi does on hers. The same goes for your LinkedIn and Xing profiles: anywhere you have a web presence, label yourself as a UX designer. 3. Tell a coherent story — your story! The purpose of a portfolio is to tell your story. How did you end up here? What makes you a great designer? Even if you don’t have a design background, Tobias is a firm believer in embracing the past. He encourages new UX designers to reflect on their previous experience and identify certain skills and events that have shaped their outlook. Take Claire for example, a former nurse turned UX designer who has found many similarities between the two professions. On her portfolio, she explains: “UX design appealed to me because it embodies many elements of nursing including empathy, a user-centric approach, and understanding the needs and motivations of others.” So many things are transferable; the trick is to find the links and weave them into a flowing narrative. Now you’ve made it clear that you’re a UX designer and have captured the recruiter’s attention, they’ll want to see some of your work. When showcasing your projects, it’s important to focus on the process. As Tobias explains: what makes a great UX designer is a deep understanding of the process and its purpose, and being able to execute that — it’s not necessarily about having the best idea or being able to create the best wireframe. Potential employers want to understand how you work: how do you solve problems? How do you come up with ideas? Introduce each project with a meaningful headline, and state your role and how you contributed. Include an introductory paragraph where you explain the problem and what you set out to achieve, followed by an account of the process in your own words. Share the evolution of your project from paper sketches to mockups to high fidelity mockups, showing how you use and break down design thinking. This is what employers are really interested in, so make sure each case study in your portfolio allows a glimpse inside your designer mind. When creating your portfolio, you don’t need to include every single thing you’ve ever done. Rather, choose what to emphasize based on the kinds of roles you want to pursue. If you’d like to focus on research, for example, make this the focus of your case study. Likewise, only include color palettes and typography if you’re also interested in UI design. It’s all about playing to your strengths and curating the image you want to portray of yourself. When deciding whether to include something, ask yourself: how does it help to tell your story? Tobias advises that the whole portfolio website should provide a holistic experience; it doesn’t have to demonstrate every single skill or technique you’ve ever used — it’s enough to highlight those that are relevant to your job search. Tobias also recommends including data if possible. Measurable results about the outcome of your projects can really set your portfolio apart, be it an increase in sign-up rate after a website redesign, or a boost in revenue. It’s important to understand that UX design is about business, not art, and numbers help to convey this. Don’t worry if you don’t have this data to hand, though: there are other ways to let your business knowledge shine through. When describing the problem statement and outlining the objectives, factor in the business goals and show that you are designing for both the user and the company. Photos are absolutely paramount to telling your story, so be sure to include plenty of visual evidence. Action shots are great for curating your UX designer image; whether you’re working on a wireframe, reviewing some sticky notes or leading a creative brainstorm, capture it on camera! If you forget to take photos, it’s ok to stage them at a later date — just steer clear of stock images. At the same time, keep hold of any artefacts that help to document your UX process, such as iterations and sketches. These don’t need to be featured in high resolution; it’s more about showing that you were hands-on with the project. If you’re new to UX, you might also be wondering how you can grow your portfolio. First of all, you’re not expected to have loads of projects. As long as you can show how you work as a designer, quality wins over quantity every time. However, there are certain things you can do to gain more experience and enhance your portfolio. If you can get involved in real-world design projects, these are the most valuable pieces for your portfolio. Search online for volunteer projects, ask your friends in UX if you can get involved in their latest gig, or try your luck at some paid freelance work. Alternatively, go back to any work you’ve done in the past that might have had certain aspects of design thinking, user empathy, research or usability testing. Include these projects in your portfolio to help show your journey into UX design. Another way to build up your portfolio is through mock projects — or unsolicited redesigns. In this case, you give yourself a hypothetical project to work on, such as redesigning an existing website or building an app for a made-up brand. A great example is Priyanka Gupta’s redesign of the Sephora iOS app. She documents the entire process from start to finish, complete with action shots and before and after screens. If you do include mock projects, it’s important to state clearly that you’re not affiliated with the brand in any way. For inspiration, check out these 5 portfolio project ideas for beginners. 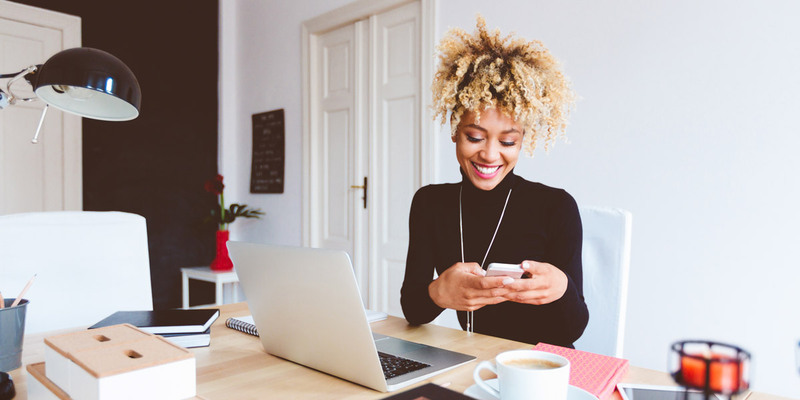 Believe it or not, you can also enhance your portfolio by blogging. Even if you’re writing from a beginner’s perspective, topical blog posts show that you’re passionate and ambitious when it comes to UX. Tobias recommends picking a topic that you’re interested in — say, virtual reality or voice design — and learning more about it. Write about why it interests you, what you’ve learned and why you think it’s important for the field. This adds another unique dimension to your portfolio, helping you stand out and make an impression. What makes a UX design portfolio really stand out? Fancy animations — but only when done well! A hint of personality: feature an interesting fact about yourself, but remember that you’re appealing to a professional audience. A compelling story: the strongest portfolios show why you’re an awesome UX designer, and how this was a natural career step for you. Don’t make your portfolio too long! Err on the side of concise, sticking to those elements that are most relevant to the story you’re trying to tell. Don’t include videos. Instead, screen capture interactive prototypes and add music and subtitles if possible. According to Tobias, this looks much more professional. Don’t just show pretty pictures. Remember, employers want to hear about your process and how you solve problems, so keep this in focus. Don’t neglect the UX and UI of your portfolio. You’re a designer, after all, so make sure you have a clean layout, clear typography and a good color scheme. There’s no need to go overboard with this, but the last thing recruiters want to see is a sloppy-looking website. Don’t get lost in the details. Not all sketches, photos, procedures and techniques are meaningful for your portfolio — remember, curate that story! Don’t get hung up on quantity. Some designers have 20+ projects in their portfolio, and if you’re just starting out, it’s easy to feel intimidated by such numbers. However, quality is much more important: even with just a few case studies, you can still stand out if you present them well. Now you know all there is to know about building a top-notch portfolio. Before you get started, browse the web for inspiration or take a look at what former CareerFoundry students have done. Ready to start building your UX design portfolio? Run through our checklist to make sure you’ve got everything you need. What are some of your favourite UX design portfolios? Share your thoughts in the comments section below!